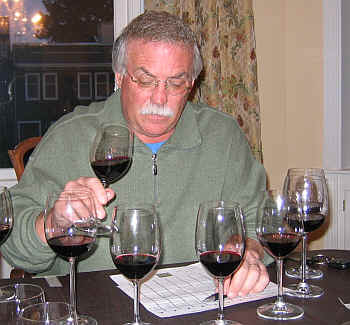 In our search for good, reasonably-priced wines, we turned to the Rhone Valley for this blind-tasting of Syrahs. While traveling around France, we routinely look for Crozes-Hermitage or Saint-Joseph reds on wine lists as these tend to be of good quality and value. 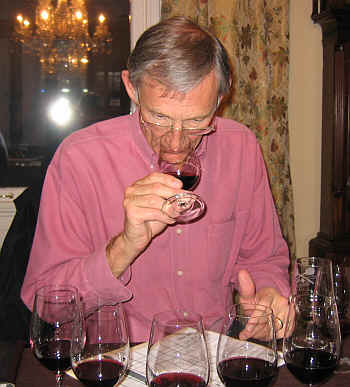 The 2005 vintage is well-regarded in the Rhone and we assembled a set of eight wines. The large "ambassadors" of the region, Chapoutier, Jaboulet and Delas had wines in this flight. We would have included a bottling from Guigal, but their 2005s have yet to arrive in our market. We had a few smaller estates in the mix. All the wines were of good quality, happily. This made for a close "horse race" as the top four wines were within a mere 6 points of each other. Our last place wine, interestingly, had NO last place votes, while the first place wine did, indeed, garner the most first-place votes. 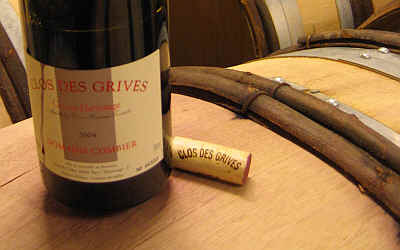 8th Place: DELAS 2005 CROZES-HERMITAGE "Les Launes"
Showing medium+ ruby color, this was a rather charming wine. It suffered only from being a shade lighter than most of the other wines in this line-up. The nose was also quite distinctive, displaying floral, rose petal fragrances. There's an underlying spice tone, as well. It's a medium-bodied Syrah with some chalky tannins on the palate. Red fruit flavors are evident with some spice and floral flavors. I found it nice now but it can be cellared another 3 to 8 years. I gave it a one-and-a-half star rating on my three star scale, no stars being a standard quality or ordinary wine. 7th Place: JABOULET 2005 SAINT-JOSEPH "Le Grand Pompee"
While most people did not find this to be to their taste, I found it to be one of the most classically typical Rhone wines of the set. 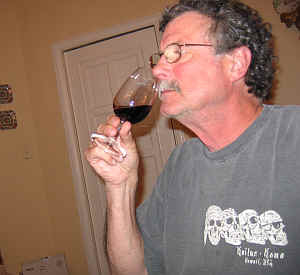 It's medium ruby red in color with textbook spicy, hickory, peppery notes on the nose. Medium-full on the palate, the wine is moderately tannic and shows the spicy, peppery flavors one encounters in developed Cte-Rotie, Cornas and Hermitage wines. It can probably be cellared for 3 to 8 years. One and a half stars. 6th Place: CHAPOUTIER 2005 CROZES-HERMITAGE "Petite Ruche"
Medium ruby in color, this wine was simply less intense and a bit closed, hampering its performance. 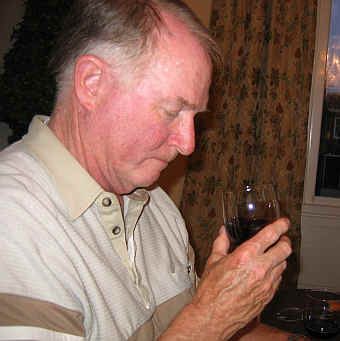 There was an underlying berry fruit to the aromas, but it was less fragrant than most. It's a simple, easy-to-drink wine and comparable to a good, basic Cotes-du-Rhne from the Southern part of the appellation. It simply didn't have the intensity of other wines in this flight. One star...drink now-2012. Showing a deep purple color, this wine offers lots of dark berry aromas and ripe fruit with a mildly spicy and mildly woodsy character on the nose. It's medium-full to full-bodied on the palate. Dark fruit flavors are encased in a moderately tannic 'shell.' The wine is full, big and intense. I estimate it can be cellared for 5 to 15 more years. One-and-a-half stars, presently. With a medium+ ruby red color, this wine is hampered, initially, by a mildly funky, dirty element which seemed to blow off. There's a brown spice quality which emerged after 10 to 20 minutes in the glass. It's a medium-bodied Syrah with easy-to-identify "Rhne" flavors...nicely varietal and it ended up being quite good. This has modest aging potential. One-and-a-half stars. 3rd Place: JABOULET 2005 CROZES-HERMITAGE "Domaine de Thalabert"
Deep red/magenta in color, this wine starts with lots of nice berry and black fruit aromas. I was missing a bit of spice on the nose, but perhaps this will develop if given some time in bottle. It's a medium-full bodied wine with nice, deep fruit on the palate. There's a spicy tone and a lightly woodsy flavor. Mildly tannic, it's quite a good wine. Drinkable now-2015, or so. One-and-a-half stars. 2nd Place: DOMAINE DES REMIZIRES 2005 CROZES-HERMITAGES "Cuve Christophe"
My last place vote kept this blockbuster from winning the tasting, but I still found many positives in this huge red. The color is a fully-saturated purple. 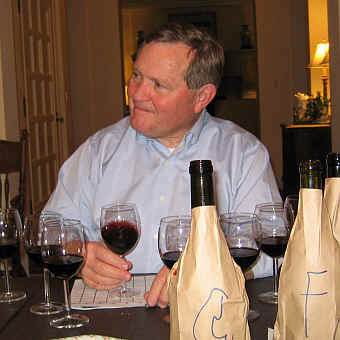 I was slightly bothered by the pushing-the-envelope ripe quality of the wine. It's close to being a bit jammy and there's an earthy aspect I wasn't fond of. Still, it's a heady, spicy red. Full bodied and intense, the wine is a blockbuster, though not as over-the-top as many California or Australia wines. It's fully extracted, though and a big, deep, dark wine. I found it difficult to predict how this will evolve in the bottle, as it's showy now. It's certainly a style which finds many fans here. 1st Place: DOMAINE COMBIER 2005 CROZES-HERMITAGE "Clos des Grives"
The first place wine with the group was also my top selection, though it does have a shade more oak presently than most of the other wines. The color is a dark purple and there's a lovely spice quality on the nose with peppery and oaky elements. It's a full-bodied red, with nice cedary, woodsy and spicy flavors. Very fine. Drinkable now to 2018, or so. Two stars+.